Heat grill. 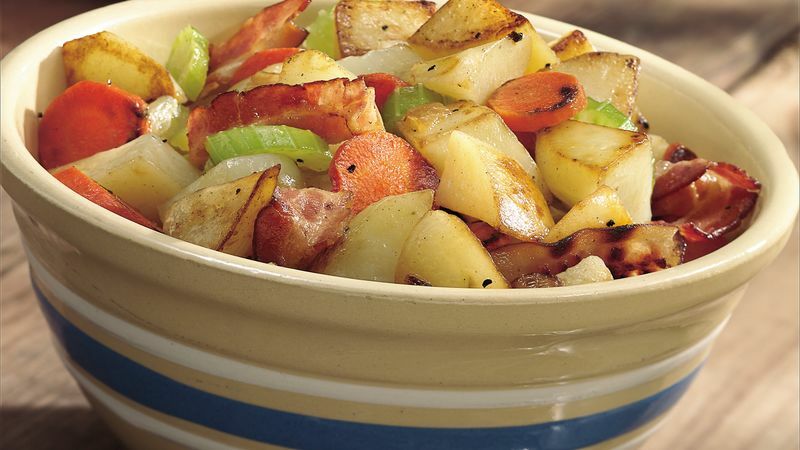 In 3-quart microwave-safe casserole, combine potatoes, onions, carrots, celery and water. Cover with microwave-safe plastic wrap. Microwave on HIGH for 5 to 6 minutes or until vegetables are hot and have just begun to cook, stirring once during cooking. Drain. Stir in salt and pepper. Cut 18x18-inch sheet of heavy-duty foil. Place potato mixture on foil. Top with bacon and dot with margarine. Wrap securely using double-fold seals, allowing room for heat expansion. Immediately place on gas grill over medium-high heat or on charcoal grill 4 to 6 inches from medium-high coals. Cook 25 to 30 minutes or until vegetables are tender. To serve, carefully open foil packet to allow steam to escape. Partially cooking these potatoes in the microwave shortens the grilling time. Purchase the precooked bacon slices in the grocery store meat department. Or try cooked bacon pieces packaged in jars or resealable plastic bags; look for them near the salad dressings. Serve this dish with barbecued chicken or grilled chicken.